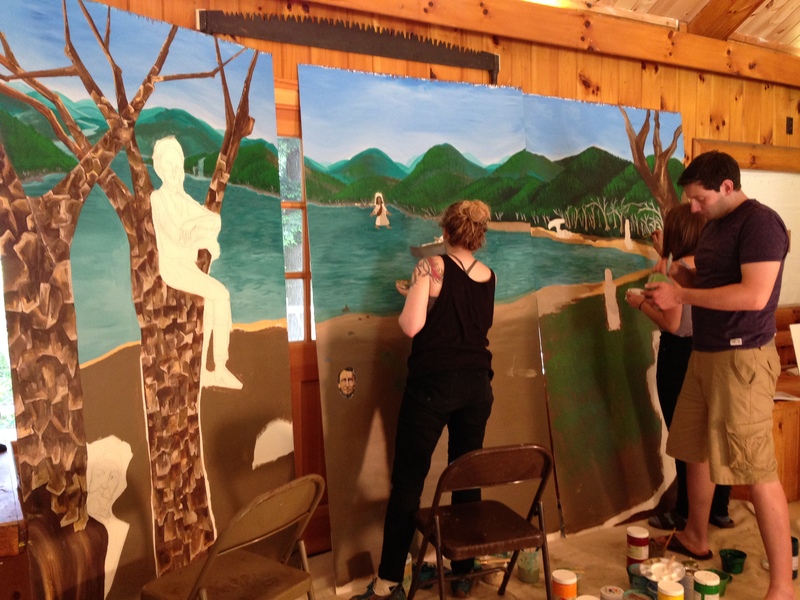 Community residents voiced their concerns about a plan to redesign two local playgrounds around a floodwall that’s part of the coastal resiliency project planned for the East Side. They got a chance to provide input on changes for Asser Levy and Murphy’s Brothers playgrounds in a meeting last Thursday. This was the second public meeting on the subject. Meanwhile, some residents were frustrated that the proposals from the mayor’s officer were the same as those presented at the previous meeting, held last November. Carrie Grassi, deputy director for planning at the Mayor’s Office of Recovery and Resiliency, explained that this meeting was primarily scheduled to give residents a second chance to provide input at a more convenient location, since some had complained the previous meeting was held too far from the actual project area. The most recent meeting was held directly adjacent to the affected area at the VA Medical Center, while the previous meeting was held at Washington Irving High School. “We wanted to give more people the opportunity to see the presentation with fresh eyes so they were unbiased in their feedback,” she said. Starting on January 1, New Yorkers will have the opportunity to ride the brand new Second Avenue Subway – a project over one hundred years in the making and once considered out of reach. We still have a long road ahead of us, but we have reached a major milestone and New Yorkers are right to celebrate. We should all make a New Year’s resolution to see this project through to the end and complete the entire Second Avenue Subway. The new line is expected to carry 200,000 riders each day, easing congestion on the Lexington Avenue line, which carries over 1.3 million riders daily and is the most heavily trafficked subway line in the city. Easing congestion means faster running and less crowded trains. It means that we get to work faster and return home to our families sooner. Even better, it means that East Siders will feel more comfortable during their ride. The city has been exploring options to redesign Asser Levy Playground and Murphy’s Brother’s Playground, since both will be affected by the construction of flood protection along the East Side of Manhattan from East 23rd Street to Montgomery Street. Earlier in the month, representatives from the Mayor’s Office of Recovery and Resiliency discussed the proposals at a community meeting held at Washington Irving High School. Carrie Grassi, the deputy director of planning for the Mayor’s Office of Recovery and Resiliency, mentioned how the East Side Coastal Resiliency Project will run adjacent to both parks and construction will disturb activities there. However, since the city is only in the concept design stage with the project, Grassi said that decisions for all aspects aren’t necessarily final yet. One such instance is the placement of the floodwall as it approaches the Asser Levy Playground. One configuration has the wall bordering the park along the FDR Drive, turning along East 25th Street and connecting with the floodwall that the VA Hospital is working on. “But some feel that would be too imposing,” Grassi said. Congresswoman Carolyn Maloney gathered with local politicians and community residents at Solar One last Friday to encourage participation at upcoming workshops that will help design the East Side Coastal Resiliency Project, a plan that was designed in response to the damage wrought on Lower Manhattan as a result of Hurricane Sandy. President Obama’s Hurricane Sandy rebuilding task force created the Rebuild by Design initiative in August 2013 and held a design competition for coastal resiliency projects. The US Department of Housing and Urban Development selected the BIG (Bjarke Ingels Group) Team and their project that will protect the Manhattan waterfront from West 57th Street, around the tip of Manhattan up to East 42nd Street. The first phase of the project will focus on the area in Manhattan from Montgomery Street to East 23rd Street. HUD awarded $335 million in federal funds in June, 2014 for that specific phase of the project, to create a protective system for that area of Manhattan. The project is meant to shield the area from flooding as well as provide more access to the waterfront, more open space and other environmental benefits for the community. 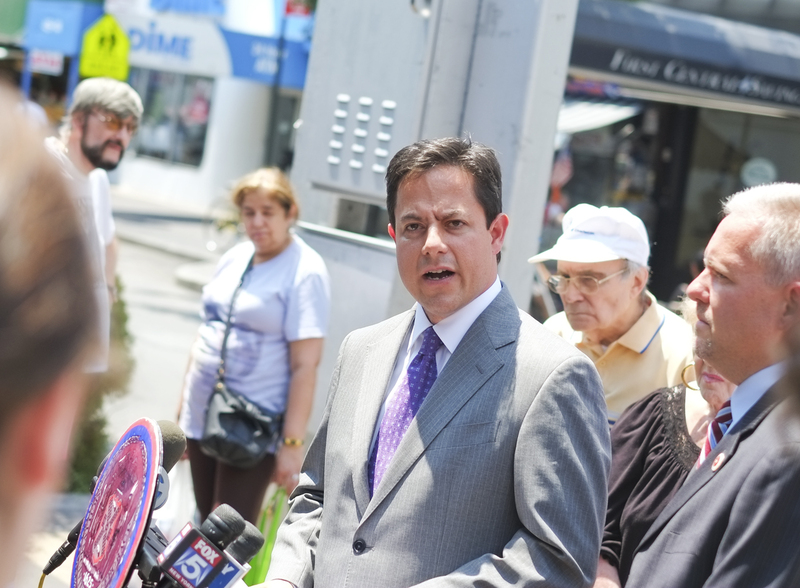 Council Member Dan Garodnick is aiming to rein in cyclists who flout traffic rules. Noting that the problem of bike riders failing to yield to pedestrians has become an increasingly common problem on the East Side of Manhattan, the council member penned a letter to five precincts covering the area in the hopes of getting cops to step up enforcement of bike infractions. In the letter, which was sent to the commanding officers of the 13th, 17th, 19th, Midtown South and Midtown North Precincts, Garodnick said that it’s no longer just delivery people who can be blamed for cutting off pedestrians or riding the wrong way in the bike lanes. Other problems he’s noticed include riding on the sidewalks and riding in the right direction on the street but outside of bike lanes. In those cases sometimes Garodnick said he understood cyclists were breaking the rules for their own safety so he also asked police for more enforcement of vehicles illegally stopped on bike lanes or those who don’t yield to bike riders. Garodnick noted that he didn’t think enforcement should come via a “ticketing blitz” on select days but be a regular routine and he also suggested more cops be deployed on bikes specifically for this purpose. He also noted that he’d been in touch with Transportation Alternatives, and the organization had since committed to doing outreach in areas the precincts believe it might be helpful. Since sending the letter last Thursday, Garodnick said he said he’d heard from precinct commanders who said they were aware of the problem. Indeed, inconsiderate bike riders are often the bane of community residents who voice their concerns at monthly meetings of the 13th Precinct Community Council. While Garodnick noted that Central Park, which is in his district, has had the most high profile issue with bike infractions, the rest of the district, from the Upper East Side down to Stuyvesant Town, has just as many. On Tuesday, three local Democrats easily held on to their positions as voters, along with re-electing Andrew Cuomo as governor, also re-elected Congresswoman Carolyn Maloney, State Senator Brad Hoylman and Assembly Member Brian Kavanagh. Maloney won with 79.85 percent of the vote, defeating former seminary student and former Pfizer employee Nicholas Di iorio, who got 20.15 percent. Di iorio had fought tooth and nail for each vote though, having sent out near daily press releases blasting his opponent in the weeks leading up to the election on everything from her trip to China to secure a panda for New York to failure to get many bills passed in Washington. For this he labeled her ineffective. He’d also hounded his opponent for a debate, and did eventually succeed in wearing her down. The only debate of the campaign took place at a newspaper office in Queens last Thursday, focusing on issues of interest to that part of the district. Meanwhile, by Tuesday morning, Maloney reported doing well with voters she encountered while campaigning. 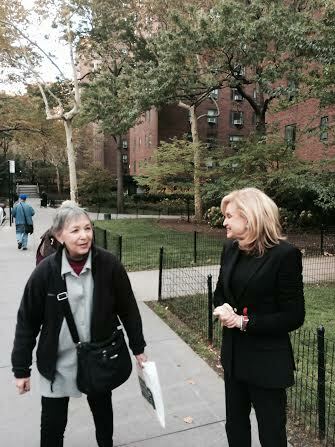 After casting her own vote at the 92nd Street Y, Maloney also made several stops throughout the district, including popping by Stuyvesant Town in the afternoon. Some voters had gripes about long lines to cast their votes, although this year, without a presidential election, lines weren’t exactly spilling out of polling place doors.“It’s definitely lower (turnout) than in a presidential year, but people are coming out to vote,” said Maloney. She added that she would work on trying to keep lines shorter in the future, either by pushing for more polling sites or the creation of smaller voting districts. Other goals included making it easier for people to buy homes, doing away with excessive bank overdraft fees and getting a bill for women’s equality passed, that has, since Maloney’s been in office, failed to do so. On Tuesday, Di orio was also making various campaign stops around the three-borough district, starting on the Upper East Side, where he lives not far from Maloney, Greenpoint, Brooklyn and later Queens. 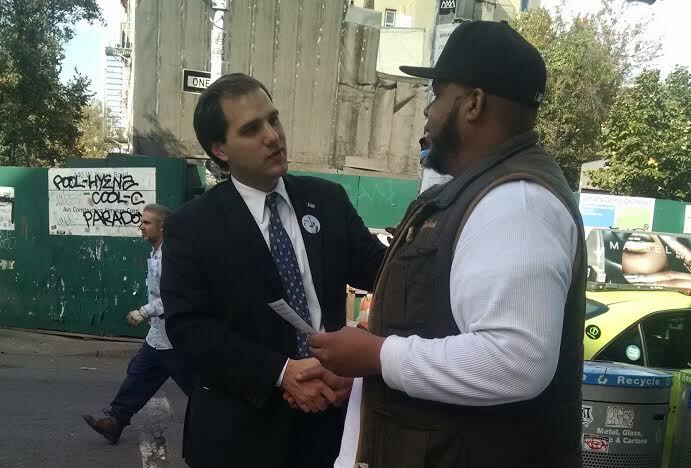 At around 11 a.m., he was in Manhattan, after voting at Knickerbocker Plaza on 91st Street. He said for the most part voters he was encountering were familiar with his campaign, having read interviews with him in Town & Village and other newspapers. When voters stopped to chat with the candidate, typically they had questions that were economy-related. This is where he felt his background working to save money for a pharmaceutical giant worked in his favor. His platform was based around cutting corporate taxes to keep jobs from going overseas. Later, when asked about the contentious nature of the race, Maloney dismissed her opponent’s steady stream of criticism as a typical Republican tactic. But not all Republicans used tough guy tactics in this race — or even any tactics at all. Hoylman and Kavanagh both sailed to reelection thanks to their opponents, Stuyvesant Town resident Frank Scala, and East Villager Bryan Cooper, respectively, not running active campaigns. Kavanagh won with 85.06 percent of the vote, while Cooper got 14.94 percent. Hoylman got 85.66 percent while Scala got 14.34 percent. 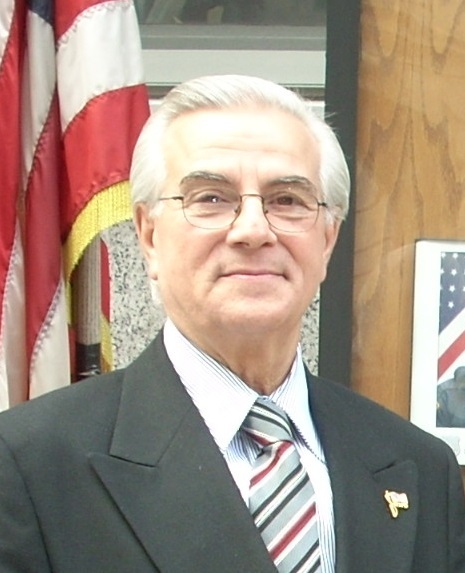 Scala, who’s the president of the Albano Republican Club and the owner of a Fifth Avenue barber shop, said he only ran for State Senate after being asked by the Republican County Committee. But he didn’t seek attention beyond participating in a candidate forum last week hosted by the 17th Precinct Community Council, which his opponent didn’t attend. And this wouldn’t be the first time in recent years that local candidates have run just to have a Republican on the ballot. In Manhattan, there hasn’t been a Republican elected since the late Roy Goodman left the State Senate in 2002.
Cooper, a production assistant and Navy veteran, said he’d been hearing disgust from his neighbors about corruption in Albany and Cuomo’s handling of the Moreland Commission’s dismantling. Lack of jobs was another concern. He also said that following Mayor de Blasio’s efforts to end stop-and-frisk, he’s found that people no longer feel safe. As world leaders convene in New York City next week for a United Nations Summit on Climate Change, more than one hundred thousand people are expected to attend a mass demonstration demanding action on the climate crisis. Organized by a coalition of over 1,200 environmental, labor, faith, and business groups, The People’s Climate March will be held this Sunday, September 21. The march comes less than two years after Superstorm Sandy caused more than $65 billion in damage along the east coast and as the world continues to experience extreme weather events including severe drought in California and the worst flooding South Asia has encountered in more than a century, all of which scientist consensus increasingly links to manmade climate change. Residents of East Lower Manhattan, along with neighborhood organizations such as Good Old Lower East Side (GOLES), are campaigning to get their neighbors to join the march, which will start at 11:30 a.m. on Central Park West and proceed south through midtown. Area organizations that have signed up as partners of the Climate March include the New School, the Sara Roosevelt Park Community Coalition, the Sixth Street Center, La Plaza Cultural, 9BC Tompkins Square Block Association and the NYC Community Garden Coalition.